What Difference Do I Make? Many of us may wonder what difference our lives are making. It needn't be so. The most powerful art in my view is that art with the most powerful message. These are some of my favourites. Click on image below to enlarge or download. 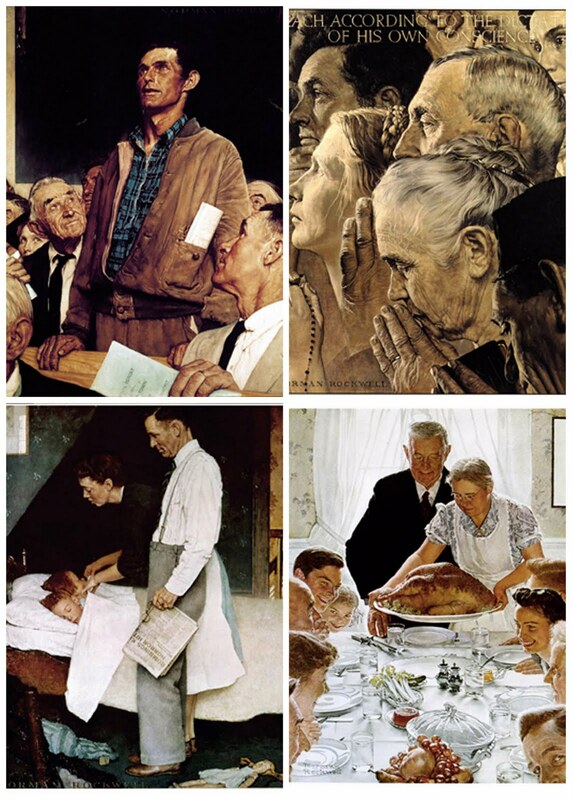 Norman Lincoln Rockwell's "Four Freedoms" including (clockwise): "Freedom of Worship, Freedom from Want, Freedom from Fear, Freedom of Speech"
Robert Weir's "Embarkation of the Pilgrims" is displayed in the rotunda of the United States Capital. It depicts the Pilgrims on the deck of the ship Speedwell on July 22, 1620, before they departed from Delfs Haven, Holland, for North America, where they sought religious freedom. The group is solemn and contemplative as they pray for divine protection through their voyage; the words "God with us" appear on the sail in the upper left corner. 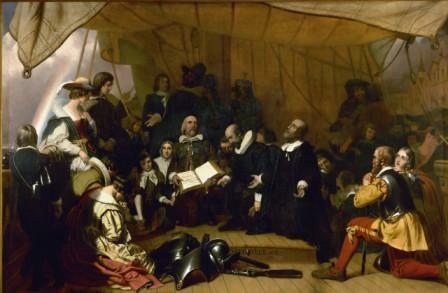 The figures at the center of the composition are William Brewster, holding the Geneva Bible; Governor Carver, kneeling with head bowed and hat in hand; and pastor John Robinson, with extended arms, looking Heavenward. The armor, helmet, and musket in the foreground represent the tools that the Pilgrims will use for protection in the new and unfamiliar land. In the background on the right are the city and people the Pilgrims leave, and on the left a rainbow represents the hope and promise of what lies ahead.